Photographers call them the “Golden Hours” … that time of day just before (and after) sunrise and sunset when the landscape seems illuminated, when long shadows add texture to the scene, when something almost magical happens. Taking pictures is, after all, all about light. And learning how to use both kinds of light is critical to the creation of memorable photographs. Both kinds of light? Yes, both. In photography there are two kinds of light: Ambient and Reflected. Ambient is the light that falls on your subject, let’s say from the sun. Reflected light is the light coming back to the camera from the subject. The important thing to know about ambient sunlight is that it has color in it, and that that color affects how you see – and will photograph – the subject. And here’s the tricky part: Our human eyes have the ability to adjust our perception of light. The camera does not. In the old days – when we used film – we would buy film that was color balanced to the environment we expected to shoot in, or use a special “color correcting” filter to adjust light before it hit the film and was recorded. Today digital camera manufacturers have installed a “White Balance” setting in their cameras. “White Balance,” simply explained, controls the way your camera records the color of light. When pointed at a subject, the camera’s computer literally analyzed all the colors it “sees,” finds the one that is closest to white, and adjusts itself so that that color is – in fact – truly white. It then adjusts all the other colors in the scene according to that white point and takes away any “color cast” as best it can. It isn’t perfect, but your camera’s Auto White Balance (default) setting works fine most of the time. But there will be times when you might want to take control, and use one of the other “custom” settings – incandescent, fluorescent, open shade, flash, etc. You might even want to do a “custom” white balance setting, by putting a piece of white paper in front of your camera – with the source of light falling on it – and balance the light according to your camera’s instruction manual. You may have to get up early, or stay out a little later to capture the unique quality of light we’re talking about here. 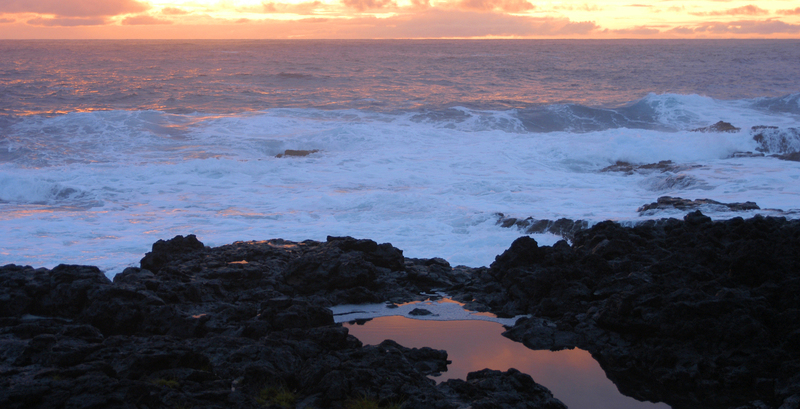 I took this image very early one morning when Kay and I were staying at the Hotel Hana, Maui, Hawaii. It’s an expensive place to stay … so I only had one early morning chance to capture the sunrise. But, hey, it was her birthday. I wanted to capture a special image to celebrate a special time. I’d say this image is more about Reflected rather than Ambient light, because the scene is illuminated by the brightening sky above rather than direct sunlight (since, as you can see, the sun hadn’t risen yet). Here are two other examples I hope will inspire you to get up early. The first one was taken from the top of Haleakala Volcano, Maui, the morning before the previous shot. This next one was taken after the sun rose – as you can see – but it was a very misty morning on Santa Rosa Sound in Northwest Florida. So the sun itself becomes part of the composition. It’s seldom possible to shoot directly at the sun – and not good for your eyes or your camera! But sometimes it works!